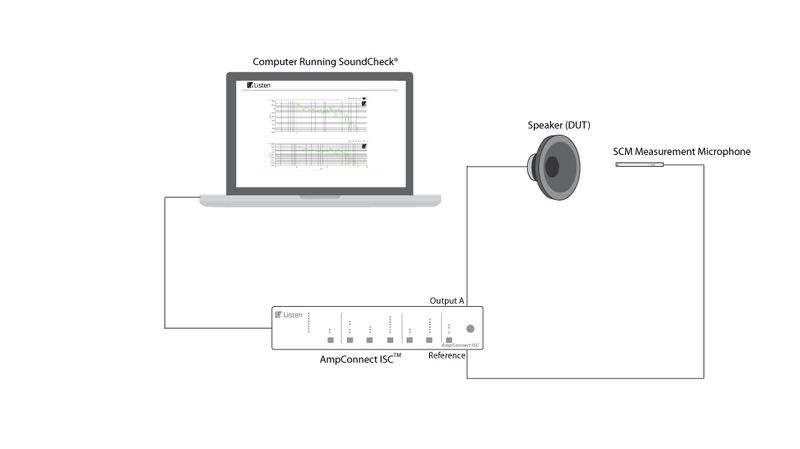 AmpConnect ISC – Listen, Inc.
AmpConnect ISC is a complete, self-contained audio measurement interface which provides a complete solution for measuring speakers, headphones and microphones. Replacing multiple hardware devices, AmpConnect ISC connects to your computer via a single USB cable and is fully integrated with SoundCheck. The initial setup is fully automated; SoundCheck automatically detects when an AmpConnect ISC is connected and reads the factory programmed calibration data – no user intervention is required. In addition to the audio interface, AmpConnect ISC also provides microphone power, drives speakers and headphones, and includes impedance measurement circuits. Further features include automated control of signal routing, input gain and instrument configuration. Especially useful is complete integration peak level detection and automatic input gain control. When used with SoundCheck the input gain is automatically optimized for every acquisition. AmpConnect’s simple setup and compact package make it ideal for production line applications. The digital I/O ports can be used for communicating with relay boards, lighted pass/fail indicators, footswitches and other devices. The front panel can be disabled, locked out, and the instrument controlled exclusively via SoundCheck to ensure that the hardware is always configured correctly. Furthermore, automated output signal routing and dual microphone inputs allows AmpConnect to be configured to alternate between two test stations, maximizing throughput. It also offers excellent functionality for the R&D lab. The two independently configurable signal routing options enable virtually any test to be realized – for example they can be used for measuring impedance using the internal reference loads (and Listen’s patent-pending high accuracy single channel impedance measurement method), connecting the output of the power amp back to the soundcard for calibration, or sending reference or DUT signals to the outputs. Dual measurement microphone inputs with low noise pre-amps and automatically controlled gain from -20 to +40 (in 10 dB steps). Automated control via SoundCheck or manual control via the front panel interface. 2 Channel, balanced inputs and outputs, supports up to 44.1 kHz sample rate and 24 or 16 bits.